A season-opening upset loss to Burnsville on Saturday, Nov. 27, might not have been the worst thing that could have happened to Hill-Murray, a team that is on everyone’s short list of favorites to win the state Class 2A championship. As for what that Pioneers’ loss meant for Duluth Marshall, well, let’s just say it’s never a good idea to stand in the path of a hurricane. 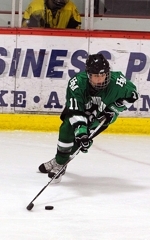 The Hilltoppers caught the full force of a machine-like Hill-Murray assault on Tuesday, Nov. 30, as the Pioneers rolled to a 7-0 victory that was so lopsided much of the third period was played under running time (by state high school league rule the clock doesn’t stop when the lead is six goals or more). Witnessing it all from a safe distance was Tim Shaughnessy, the Pioneers’ senior goaltender who was so upset about allowing five goals in the loss to Burnsville he couldn’t sleep that night. 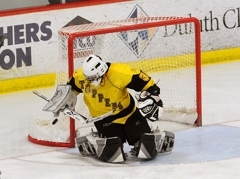 “I don’t know, I was just beating myself up about it,” said Shaughnessy, who played in the Upper Midwest High School Elite Hockey League in the fall and was one of four league goaltenders selected to play in the Bauer National Invitational Tournament in November. Shaughnessy eventually cleared his head over what was a long, fitful weekend. Against the Hilltoppers, he proved he was back to his rock-steady form even if his performance wasn’t brimming with sprawling saves and circus acrobatics. The senior was credited with 14 saves, including just four over the final two periods. It was a total that seemed noticeably low, especially to Shaughnessy, who couldn’t help but wonder if button controlling the Duluth Marshall shot total on the scoreboard was broken. Shaughnessy’s bounce-back performance was just one of many for the Pioneers, who also got big production from their top line of Ben Bahe, Kevin Becker and Andy Faust (each had a goal) as well as a smothering performance from their six defensemen. Duluth Marshall, which suited up just nine forwards and five defenseman, lost forward Mac Dow in the second period when he was called for a checking from behind misconduct. While the Hilltoppers killed the 5-minute power play that resulted from the call, it was clear they didn’t have the resources to match the Pioneers – who played four lines and six defensemen -- over the game’s second half. As for the notion of catching Hill-Murray at the wrong time, Flaherty wasn’t convinced. “That is one high-caliber hockey team,” he said. “They are tough, they are fast, they are smart, they don’t yell at the refs. Shaughnessy stopped 14 shots en route to his first shutout of the season. His stellar performance comes off the heels of a 6-4 loss against Burnsville in which Shaughnessy let in five goals. 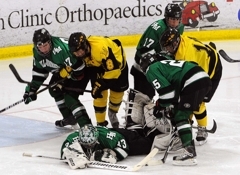 The Hilltoppers nearly scored with about five minutes remaining in the third period, but Shaughnessy made an acrobatic save by gloving the puck in midair while laying on his back after he made an initial save off of his left toe to prevent a nearly empty net goal. Becker netted the sixth goal of the game for the Pioneers and assisted on two other goals for a three-point game. Becker was held scoreless in the Pioneers’ 6-4 loss to Burnsville on Nov. 27. Bahe, playing on the Pioneers' top line with Becker and Andy Faust, scored a goal and added an assist. 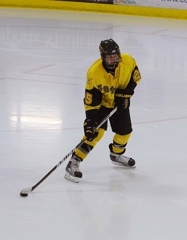 Bahe also scored in the season opener against Burnsville and has three points this season. The Pioneers led 1-0 after the opening period on a goal by Zach LaValle and, despite blitzing Hilltoppers’ goaltender Christian Coffman with a cascade of shots in the second, it remained a one-goal game until Andy Faust and Bobby Bruski scored back-to-back goals to put the Pioneers ahead 3-0 with 3:36 left in the second. Hill-Murray’s Ben Bahe scored 20 seconds into the third period to put the Pioneers (1-1-0) ahead 4-0. Loren French, Kevin Becker and Luke Voltin also scored in the period for Hill-Murray. 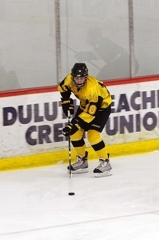 Duluth Marshall, which only dressed three forward lines, suffered a big blow early in the second period when senior forward Mac Dow was received a 5-minute major and game misconduct for checking from behind early in the second period. Although the Hilltoppers (2-1-0) killed the penalty, they were clearly running on fumes the rest of the game against the Poineers, who ran four lines and three sets of defensemen. 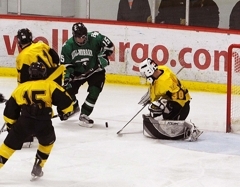 Hill-Murray senior goaltender Tim Shaughnessy, who allowed five goals against Burnsville on Saturday, earned the shutout and was credited with 14 saves. Coffman finished with 28 saves for the Hilltoppers.